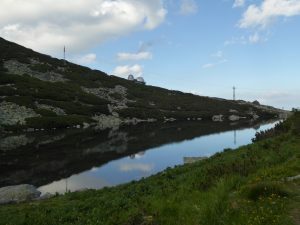 We will have a guided excursion to Astronomical Observatory located at the altitude of 1 786 above sea level near the Skalnate Pleso alpine lake in High Tatras mountains. After the breakfast (app 9:00 am), we will walk to SKI resort in Tatranska Lomnica (3.6 km) from where we will take a cabin cableway to Skalnate Pleso. A return ticket costs cca. 22 EUR (Nov 2017). A whole trip will take app. 4 hours. The Observatory was established in 1943 when the first observations of the Sun were performed. 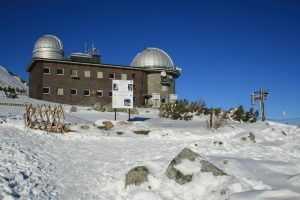 Nowadays observations are provided with a 61cm (f/4.2) automated Newtonian telescope (Jiří Drbohlav, Czech Republic) and 1.3m (f/8.36) Nasmyth-Cassegrain telescope (Astelco GmbH, Germany). The Newtonian telescope is equipped with a sensitive CCD camera and a set of wideband filters for photometric observations of minor planets and comets. Nasmyth-Cassegrain telescope is a fully automated instrument with an active optics system on a fast slewing alt-azimuth fork mount. There are several instruments available in the Nasmyth foci (high-dispersion échelle spectrograph, large-frame visual CCD cameras, and a near-infrared CCD camera). NOTE: hiking shoes and raincoat/jacket are strongly recommended.